One of Uganda's last remaining mountain gorillas. Photo by Steve McCurry. Universally recognized as one of the world’s finest image-makers, photographer has a talent for capturing raw emotion in a single picture. 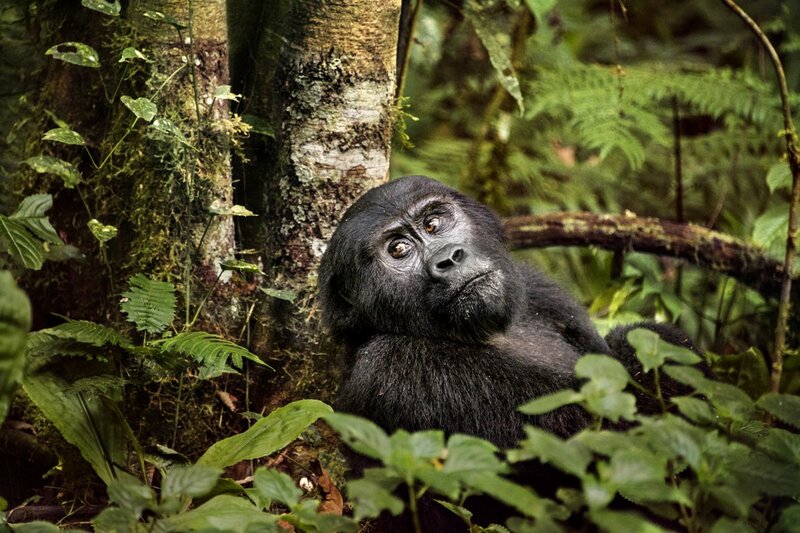 We caught up with him after a trip to East Africa with Silversea Cruises, where he photographed one of the region’s last remaining mountain gorillas. This year I started a collaboration with to capture the world in photographs. Most of the regions I will visit, like the Russian Far East, parts of the Himalayas, and Tibet, will be places in transition with indigenous people who are living and working in a very original way. I’m also looking at cities where the architecture stands out. For example, I think Venice is an important place to visit, along with Angkor Wat in Cambodia. This image was taken on my first trip, a five-day excursion in East Africa. It was early in the morning, around 8 a.m., in Uganda’s . I was following a group of gorillas on their morning routine as they ate various fruits and vegetation. Seeing these three-hundred-pound animals effortlessly go up and down the very tall trees was amazing. They were going about their business as I observed, and it became very comfortable and ordinary that I was there. They were munching and grazing — walking literally within a few feet of where I was standing — and completely ignoring me. This guy in the photo was a juvenile who had paused and looked over his shoulder. It was a profound experience to be so close to him and so totally accepted. I respected him and he respected me. I’ve always been interested in stories about the human condition and how we relate to one another and the environment we are in. What I like about this photograph is that it shows a certain personality and tenderness. There’s an emotional connection because of his human-like expression that makes me feel like we aren’t so different after all. I’m always trying to find the right light, the right moment, and the right emotion to tell a story. It’s a question of observation and experience. It also takes a lot of curiosity. For this shot, I was accompanied by a park ranger who knew how to get close to the gorillas. They have a very organized and professional system with a deep respect for the animals and their environment. Once we found the gorillas, there was no acknowledgment of our presence from them — no sense of surprise, distress, or joy. People have been visiting them for decades, so I think they’re familiar with humans. I used my Nikon D810, which is what I usually shoot with because it’s dependable, durable, and gets great results. I’ve been using various models since 1978. The photo didn’t need a lot of editing, I may have increased the contrast or darkened the background a bit. My next trip will take me to Papua New Guinea. It will be my first time visiting the country — it’s a place in transition. If I were to go back in 50 or 100 years, I have no doubt there would be major changes to the lives of the people who live there. In many cases these are good changes, but in the meantime I think it’s important to have documentation of how we once lived and conducted ourselves. – As told to Berit Baugher. is a photographer and visual storyteller. You can follow him on and . He travels for the opportunity to tell stories about the world and people who inhabit it.